ANCHORAGE, Alaska, January 7, 2013 (ENS) – Late Sunday night crews were successful in refloating the Shell drilling rig Kulluk that grounded in the Gulf of Alaska on a stormy New Year’s Eve. The Kulluk was first floated offshore while personnel assessed the condition of the vessel. The rig, which does not have its own propulsion system, is attached to the Aiviq, a Shell-owned, anchor-handling vessel with ship towing capabilities that suffered an engine breakdown in the storm last weekend. A U.S. Coast Guard marine inspector is aboard the Aiviq. Three additional tugs are on standby along with the Coast Guard Cutter Alex Haley and two oil spill response vessels. Officials decided the drill rig was safe to tow and the weather calm enough to proceed. It is currently being towed from Sitkalidak Island, where it spent a week aground, to Kiliuda Bay on the east side of Kodiak Island, about 30 miles to the north. Steve Russell, Alaska Department of Environmental Conservation on-scene coordinator, said Kiliuda Bay was one of seven nearby areas of refuge. The remote pristine bay has one fishing lodge accessible only by boat or floatplane, but it is more sheltered than Sitkalidak Island. Using infra-red equipment on board a support vessel, Unified Command officials confirm that the Kulluk is stable and is not leaking any of the 143,000 gallons of diesel and about 12,000 gallons of lubricating oil and hydraulic fluid aboard. Salvage teams successfully attached the main tow line to the 28,000-ton conical drilling rig Sunday afternoon. The vessel is “sound and fit to tow,” said Sean Churchfield, operations manager and incident commander for Royal Dutch Shell, at a media briefing Saturday. But at a news conference Thursday, Churchfield that salvage crews who boarded the vessel found damage to emergency and service generators, and to the Kulluk’s upper deck. The rig, was being towed south from the Beaufort Sea after taking part in the first offshore oil exploration in the U.S. Arctic in two decades, when it ran into a severe storm. In near-hurricane conditions, after the Kulluk had snapped numerous tow lines, the massive rig dragged the two vessels trying to tow it more than 10 miles toward shore in waves up to 33 feet and winds up to 60 miles an hour before crews cut it loose to save their own lives. 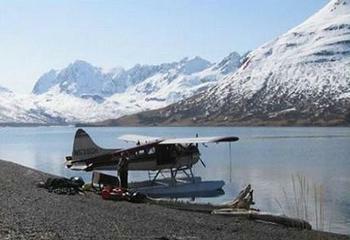 The Kulluk grounded on Sitkalidak Island, a small island off the much larger Kodiak Island. It was in an environmentally sensitive area populated by endangered whales and seabirds. As a precaution, Unified Command deployed oil containment boom with special attention to salmon streams entering Ocean Bay. The Salvage Master from the salvage company Smits is aboard the Kulluk and will remain during transit to Kiliuda Bay. A 10-member salvage crew and one Shell representative also are on board the Kulluk and will remain on the drilling unit throughout the tow. Three Seattle-based ocean-going tugs, all with towing capabilities, are supporting the transit – Ocean Wave, Corbin Foss and Lauren Foss. The tug Alert will also be connected to the Kulluk and assist in the tow. The Coast Guard Cutter Alex Haley is escorting the tow to Kiliuda Bay. A 500-yard radius safety zone around the Kulluk will follow the tow and remain in place once it is anchored in Kiliuda Bay. “Safety of the response personnel remains our No. 1 priority,” said Federal On-Scene Coordinator USCG Captain Paul Mehler III. “The very nature of the recovery operations and the difficult weather conditions must be managed without compromising safety. “Our timeline is still difficult to nail down, but we are committed to seeing this response through to a safe conclusion. Understand that as recovery operations develop, it may be necessary to alter our plans to address new issues or concerns,” said Mehler. Once in Kiliuda Bay, the 30-year-old Kulluk will be subjected to extensive inspection and evaluation by Shell, Noble Drilling, which operates the rig, and the Alaska Department of Environmental Conservation. Now, another Noble Drilling ship used by Shell for its inaugural Arctic drilling effort is being investigated by Coast Guard inspectors who have not ruled out criminal charges. 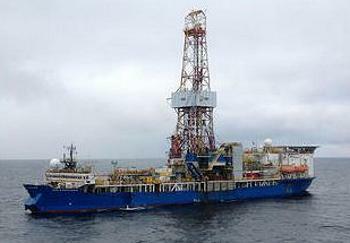 Shell used the 514-foot Noble Discoverer for drilling at one well at the Burger-A Prospect 70 miles offshore in the Chukchi Sea. But the Liberian-flagged vessel has been plagued with problems. On May 21, in Seattle, days before the ship sailed north to the Arctic Ocean, an inspection of the Discoverer found 23 deficiencies, including problems with bilge water management system, ventilation, electric system, and ship’s engine. Once these were resolved to the inspectors satisfaction, the Discoverer proceeded north. In July while in Dutch Harbor, the ship lost its mooring and drifted close to shore. An “enforcement warning” for being a “pollution source” was issued to the Noble Discoverer in Anchorage, on September 24, following an investigation into an oil discharge. On November 16, it caught fire in Dutch Harbor, an international port in Alaska’s Aleutian Islands, according to the Unalaska Fire Department. Shell called it a small fire, but the fiery blast was felt 200 yards away. On November 30, Capt. Mehler issued a Port State Control Detention for the Noble Discoverer, keeping it in port until safety violations were repaired. By December 19, the ship was released from Port Detention but remains in Seward, Alaska for repairs. The Kulluk has had three enforcement warnings in 2012 for being a source of pollution, and a Coast Guard inspection last May that found 19 deficiencies in electrical and maintenance systems. Shell did not reach oil-bearing zones this year, and the company hopes to return next year to drill deeper and find oil. But environmentalists and Members of Congress are calling for the federal government to cancel Shell’s drilling permits in view of all these problems. The coalition said these “serious incidents” warrant thorough investigation. Environmentalists have said for years that Arctic conditions are too harsh and the stakes too high to allow drilling. The Natural Resources Defense Council and The Wilderness Society Thursday called on the Obama administration to put an immediate hold on all current and future approvals for offshore oil exploration in the Arctic Ocean. Shell Oil’s long string of accidents and mistakes – culminating with Shell losing control of its Kulluk drilling ship this week – makes it crystal clear what a bad idea it is to drill offshore America’s Arctic, said Chuck Clusen, NRDC’s director of national parks and Alaska projects. “Shell’s US$4.5 billion Arctic gamble is looking like a serious mistake, and should act as a warning to other companies looking to drill in this incredibly hostile environment,” said Howells. The Department of the Interior and other agencies are currently reviewing permit applications for future Arctic Ocean drilling. 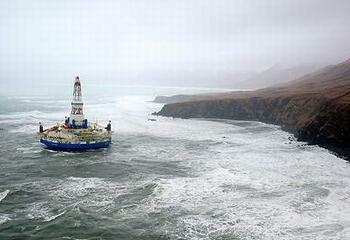 Along with Shell, ConocoPhillips has applied for permits to begin drilling in the Chukchi Sea in 2014.